Jose Manuel Barosso. Brussels, February 2012. Ukraine didn’t take much of the time of EU leaders at their meeting, sources told EURACTIV. Reportedly, the reason is that the issue of further sanctions went off the agenda, as Russia had not made a major effort to scupper the presidential elections in Ukraine [read more]. So, EU leaders adopted a declaration prepared in advance, which calls on Russia to cooperate with Poroshenko, to continue the withdrawal of armed forces from the Ukrainian border and to use its leverage on the armed separatists to de-escalate the situation in Eastern Ukraine. EU leaders also address messages to the Ukrainian authorities. In particular, they are called to “continue to reach out to the population and civil society of all regions of Ukraine, including in the framework of the round tables of national dialogue”. The present interim government has been criticised for not being inclusive of the country’s regions, especially in the East and South. The declaration also calls on Kyiv to ‘swiftly’ conduct constitutional and de-centralisation reforms, drawing on the expertise of the Council of Europe, the oldest European institution specialised in human rights. “The rights of persons belonging to national minorities need to be fully ensured in line with the relevant standards of the Council of Europe”, leaders state. Speaking to the press, Commission President José Manuel Barroso said that he had conveyed those messages to Poroshenko in a telephone conversation. The Commission President reiterated the Commission’s readiness to help Ukraine stabilise its economy. He also said that the EU executive was “heavily engaged” in trying to facilitate an agreement between Ukraine and Russia in their ongoing dispute over outstanding debts, future gas price and modernisation of the gas transit system. 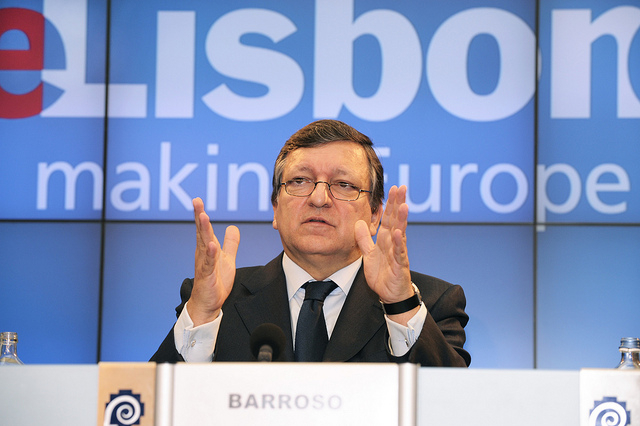 “If there is good will,” Barroso said there was a chance that an agreement on the gas dossier could be reached. “Once again I want to make clear that energy should not be used as a political weapon,” he said in a message to Russia. Barroso said that today (28 May) the Commission was going to approve the energy and security strategy, which will be discussed by EU leaders at the regular EU summit, on 26-27 June. Speaking simultaneously at her own press conference, German Chancellor Angela Merkel said she expected Russia to respect the outcome of Sunday’s election. “Should there be further escalation of the crisis, we will not exclude further economic sanctions,” she said.